The Lexus GX 460 is still in its first generation, a full three years after production was shut down for 16 days over a stability issue corrected by April 29, 2010. Since then it has taken a hallowed place in the Lexus SUV court, selling roughly 40,000 units. The GX 460 hits the middle ground between the Lexus RX and LX lines, providing greater power, cargo and passenger capacity than the mid-size RX 350, and still delivering greater economy than the full size LX line. Its 301 horsepower V8 engine is adequate for most mountain and inclement weather use, while able to tow up to 6,500 lbs for work or leisure applications. The inclusion of load leveling, variable clearance height, terrain settings, fulltime 4WD plus crawl capability make the 2013 Lexus GX 460 applicable to a wide array of activities on road and/or offroad conditions. The appearance of the GX 460 exudes power and comfort with its clean lines and understated elegance. The spindle grille that embodies the direction of Lexus design has not yet been added to this model, but you can bet it will be once the next generation comes around. Nevertheless, the former face of Lexus stares resolutely from its front – the high intensity headlamp eyes bracket the cascading oval elements of the nasal grille that hover above the expressionless mouth of the front fascia, marked by twin fog lamps at booth sides. It sits high on 18-inch Liquid Graphite wheels, looking somewhat like a big cat ready to pounce on unsuspecting prey. In keeping with that image, the LED turn indicator bearing sideview mirrors can be folded flat, like those of a panther put on the defensive. As soon as you sit on of the 10-way adjustable heated and ventilated seats, in the semi-Aniline leather and Bubinga wood trimmed interior, some small voice within exclaims, “Oh yeah!” Naturally the wood and leather steering wheel is heated, making cold winter mornings much more bearable. Three rows of seating are easily accessible (though we didn’t climb into the way back) with room for up to eight occupants. The second row splits 60/40, while the third row splits 50/50 to enable trading passenger space, in multiple configurations, for cargo area. A one-touch power tilt and slide moonroof allows the introduction of cool, clean mountain air or the ionized breeze over the Great Lakes. Any music the occupants might love is reproduced in exquisite fidelity on the Mark Levinson Premium Surround Sound 17-speaker, 7.1 Channel Architecture, multiple format, audio player. If Sports or Talk radio is your thing, it will be reproduced crisper and clearer than ever before, on a speed sensitive sound system. Driving the 2013 GX 460 instills an enveloping feeling of security and wellbeing, as though the ups and downs of the mundane world can no longer intrude in this special place you have entered. Toyota and Lexus deliver a level and safety in their vehicles, especially in the higher levels of the Lexus line, once relegated only to Volvo, though they have fallen from that lofty perch. It may well be, despite some well-publicized exceptions, that Lexus has taken that crown for itself. Ten airbags include knee and torso protection, while a host of stability and braking systems keep the Lexus GX on a reliably smooth and controlled trajectory. Quick and reliable braking is assured by ventilated disc brakes on all four wheels. Stop Start Technology, which prevents the car from accelerating if the brake is engaged, has been on hand ever since the incidence of unintended acceleration was made into front-page news. According to executives we spoke with at the time, there were fewer than 20 confirmed episodes out of the millions of cars the group has sold. Unfortunately, there were a few unintended tragedies. Nevertheless, software was installed long ago to prevent such incidents from ever recurring. Though seldom recognized as safety features, privacy glass and a flip-open hatch window contribute to occupant and owner safety. Of course, should such troublesome events as a collision or breakdown arise, Safety Connect, automatic collision notification, SOS button and roadside assistance are all there to insure a prompt professional response. 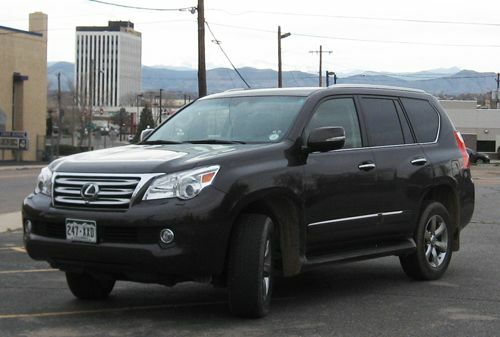 Should the vehicle be pilfered, stolen vehicle location will be used to retrieve the 2013 Lexus GX 460 as soon as possible – before it can be chopped into parts or spirited across our southern border. The EPA states the SUV gets 15-mpg in town and 20-mpg on the open road, with a combined score of 17-mpg. Our results ranged from 13.3-mpg, in slow stop and go city traffic, to 18.7-mpg descending the 10,000-foot high Kenosha Pass to the mile-high altitude of Denver. Unfortunately, the big V8 engine in the 2013 Lexus GX 460 only rates 9 out of a possible 20 on emissions, scoring only 4 on CO2 and 5 on particulates – there is a trade out between power and environmental friendliness – it’s hard to have both at the same time. No crash tests have been performed for this vehicle for several years – this is most likely because the occupants of this full-size SUV are likely to come out on the plus side of anything but the most devastating collisions. That is not to say losing control of this vehicle couldn’t do some significant damage (but that’s not easy to do) and perish forbid anyone should drive a vehicle of this size intoxicated. Driving the 2013 Lexus GX 460 was a firm reminder why vehicles in years long passed always had V8 engines – though happy to loll about town at sub-highway speeds, the GX finds its element climbing mountain passes and passing other motorists on the Interstate Highways of America. Our trip into Colorado’s mountains was a sheer pleasure as the GX 460 ate up Highway 285, crossing Crow Hill and Kenosha Pass to South Park. Easy handling and ready power made it a joy to pilot. At night, the adaptive and intelligent highbeam lighting system lit up curving mountain roads to enable and ensure accurate tracking. Unfortunately, we did not get a chance to test its offroad acumen, but we’re sure the 4.6 liter, 32-valve DOHC engine, coupled to its six-speed electronically controlled transmission with fulltime 4WD and a torsion limited slip differential – plus electronic locking, kinetic dynamic suspension and a crawl system, would have demonstrated considerable capabilities for such use. During the 2012 4XFall, sponsored by the Rocky Mountain Automotive Press, we had the opportunity to drive the 2013 Range Rover HSE. Those are the vehicles they use to protect the Queen of England, slated to very soon become a Great and Royal Grandmother. During our drive of the British SUV, we wondered if there wasn’t some way to file a homestead claim on the truck – it is called a RANGE Rover, after all. Deciding modern property laws put this completely out of the picture, we relinquished the extremely livable and likable vehicle to its rightful owners with a fair amount of regret. The Range Rover HSE totals up to something like $83K – the 2013 Lexus GX 460 is just a bit under $67K with some very pricey option packages. Nevertheless, with those options, as much as we liked the Range Rover, the 2013 Lexus GX 460 has over 90 percent of the features of the more expensive SUV for $16K less. Perhaps England should consider saving the Royal coffers a few bucks and switch over to the Lexus GX 460. Seems a reasonable thing to us.